In October 2000, IAPO announced branching out into design and manufacture of its own products in the form of the prototype A-002 autogyro. 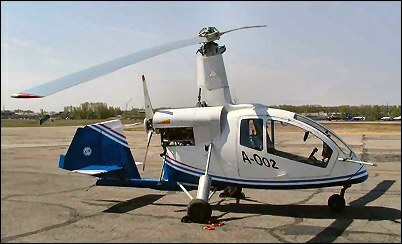 A three-seat autogyro, an experimental version had been tested in 1998. The almost complete prototype was shown at Moscow in August 2001. First flight 21 April 2002. The A-003 conforms to FAR Pt 27 and Russian AP-27. A streamlined, cabin autogyro, with pusher propeller, single, sweptback fin with large rudder, and broad track landing gear. It is equipped for engine-driven pre-rotation of rotor. All flying controls are manual, an all-moving tailplane mounted at one-third of fin height, with a horn- and mass-balanced rudder. Generally built of metal, the rudder and elevator of composites. The landing gear is a tricycle type; fixed. Cantilever-spring mainwheels; rubber-in-compression shock-absorber on nosewheel. Mainwheel tyres 400x150; nose 100x125. Hydraulic disc brakes on mainwheels. Safety tail skid on prototype; auxiliary tailwheel on production version. The prototype has one 157kW Teledyne Continental IO-320 flat-six driving a fixed-pitch, two-blade propeller. Alternative engines of 134 to 157kW and three-blade propeller can be installed. Subaru conversions were under consideration in April 2003. The A-002 has two front seats, side by side, with dual controls, and a single rear seat. Upward-hinged doors are on each side. Heating and ventilation are provided.